Hello dear friends, fear not, you have not been forgotten, I will admit to a general malaise that has made curious adventures few and far between, but I have a couple here for you gorgeous folks this evening. So let's start with some old nails and swarf... Yes, Phil is a lovely lad and he was down in Bristol recently from "oop Noorf!" when he happened to drop me a text saying hello. Well it would have been rude to ignore it, so we agreed to meet up in Gordano Services, despite the on going problems with my shoulder and have a catch up, having been friends for a long old time, since first meeting on the dark pages of B3ta! Now I know that most of you familiar with B3ta are expecting a child eating sociopath, but the truth is this, Phil is the sort of bloke you really want to know. He can fix anything, but specialises in machines from a more innocent age and despite not being born until after I left school, he has a knowledge of classic bikes that can put a lot of collectors to shame. He is also a thoroughly decent type who did not mind too much my utter failure to arrive on time. "So what caused this uncharacteristic flaw in Jayne?" I hear you ask. Well, the truth is somewhat embarrassing. You see, I was getting ready to go out and looked at my watch and though that I had plenty of time. However, not wanting to leave the poor chap too long, I hurried along with my getting ready to go out. A short while later I checked my watch again and noticed that hardly any time had passed me by, so I went and got my kit sorted and found my keys. Then I checked my watch again and noticed that in fact no time had passed me by! The damn watch battery had failed me and for over an hour, my watch had been telling the same time. Cue the sudden rush to get going. This was also the morning that Sylvie, my trusted SV, decided to fail me too. She point blank refused to start and having backed her out of the garage and locked up, she sat on the side of the road coughing like an asthmatic that has swallowed a whole feather pillow (trust me, I used to be asthmatic, so I know how this sounds!) found under a sofa! Yes, my beautiful bike failed me and I was not a happy teddy. Yet, when I mentioned threats of physical violence against my precious bike she leapt into life and we shot of down the street. Thankfully, Phil was a forgiving sort and had a little chuckle at my predicament. So after a brief chat, I waved him off as he headed his way back up to Derby and I took a mellow ride back home, sadly an act of necessity rather than an enjoyable bimble. You see my bloody shoulder has been damaged again and I have been pretty much unable to ride for the whole summer. Sylvie had clocked up less miles in three months, than she was clocking up in a week, a situation I am most unhappy about. So now I am waiting for an MRI scan so that they can look inside my shoulder and tell me that I have an impingement. Oh the joy. 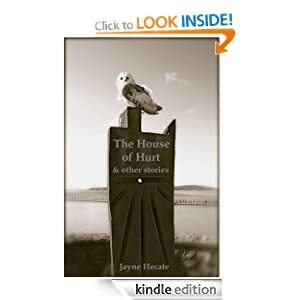 This month also saw the publication of my fabulous new book, House of Hurt and other stories. Buy my book, it is awesome! Yes, I have finally done it. After an awful lot of encouragement, I have finally collated some of my short stories into one volume that you can buy from Amazon. The work involved in writing a book is unbelievably huge and then converting it to Kindle format takes even longer. However, it was all worth it when the book was finally uploaded and we used one of Carol's amazing photographs for the cover. Yes, that is Alby the owl on there and yes it does have relevance to the book. 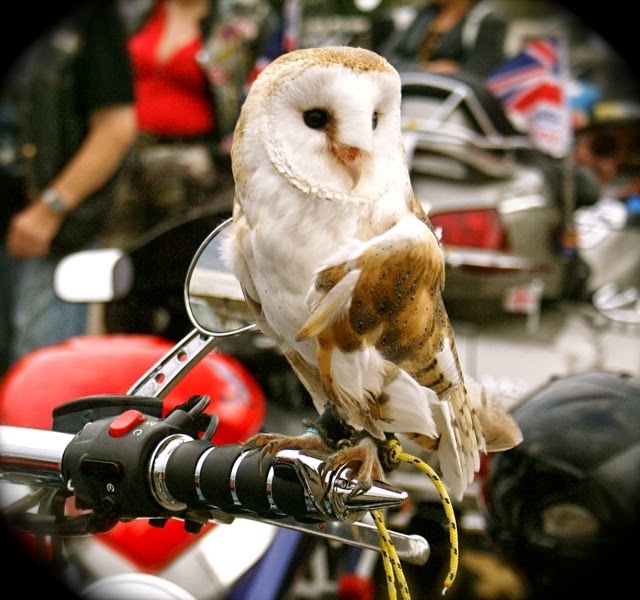 September also sees the last Weston Bike Night of 2012. Such a sad event cannot go with out passing comment after a particularly difficult summer (although let's be honest, this year we went straight from spring into autumn!) of rain, cold winds and a low turn out. All was not lost though and this year, Bike Night raised an impressive eight thousand pounds for the Royal British Legion. We would like to think that in our own way, Carol and I helped a little with that. Caught on camera once again! Huddling for warmth on a summer evening in the UK! Weston Super Mare in the summer. So with a fond farewell to Bike Night, we are left wondering what to do on a Thursday evening now and I think that all of us were sad to see it end for another year. A huge thank you must go out to Lyn and Matt who have worked so hard on Bike Night every week organising the event. 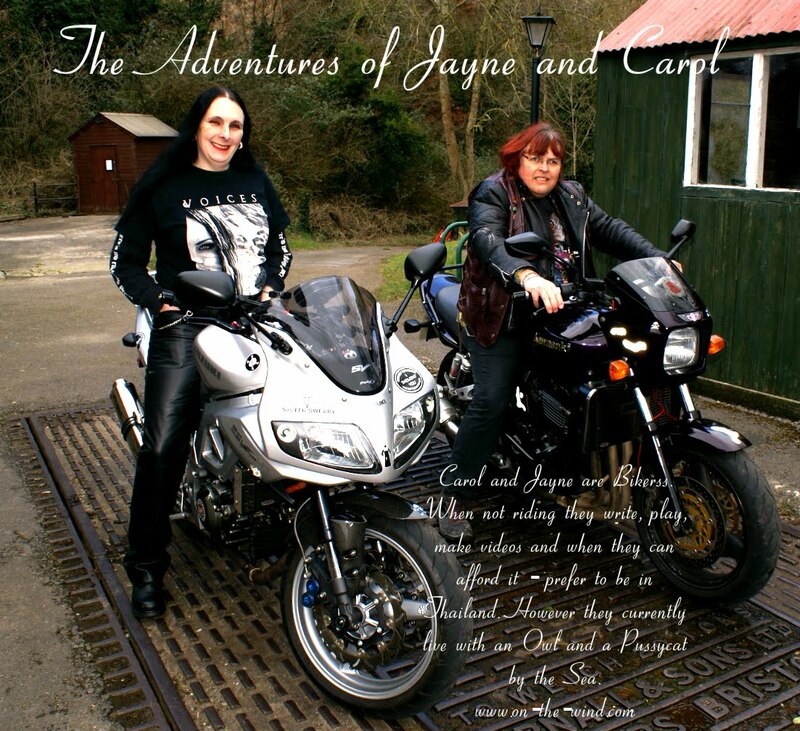 While a huge round of applause go to the team working with Carol to make Bike Night a fun event with Biker Rock Radio. Yes, I mean you Rich, Ghost, Alex, Doc, Kitty and Cookie. Also in September, the Biker Rock Radio trailer failed us. The frame cracked, the sides dropped and door would not shut anymore. So with an empty pocket and a big smile we headed over to see our friend Gareth. Jayne enjoys watching other people do the work. Given the sorry state that the trailer had got into, it was refreshing to see it catching fire from welding, but Gareth was able to fix it and together with Carol, the Biker Rock Trailer was back up to good health. Which leads us onto Gareth's skills, he is a fab welder, but never ask if you can enter his competition to beat his bike! It will cost you a pound to enter and that is all I am going to say! So with September nearly over and October rapidly approaching like a hint of cold air from under the bathroom door, we manage one last weekend of sunshine. Sadly it was not to be spent riding the bikes, it was rather spent in the garage playing with them. Alex's Yamaha DT50 generated the most interest with Alex, Carol, Steve and Gareth all getting their hands dirty, leaving Jayne to work on Sylvie. Sadly for Alex, it seems that clocking up an impressive thousand miles a month on the little bike has come at a price. The piston has given up the job and is now sulking on the coffee table, being battered and abused by bits of piston ring flying about in the cylinder. Hopefully, a new piston and a bit of fettling will see the proud little bike back on the road very soon. Just in time for another harsh winter. As for Sylvie, things were also pretty buggered. The engine fault had manifested into a "only firing on one" problem and then as I lifted the tank to work on her, the heavy fuel tank took a dive to the road, bounced on the Tarmac and got scratched. I was mortified, but Alex was there like a shot and helped to pick up the bits and pieces. Sadly, it has now become apparent just how badly the tank was resprayed following the accident last year when the biggest problem that the tank has is that the paint it so deep, it has been gouged, like furrow in a field. However, the running fault was quickly identified and two new spark plugs were rammed into place and then came the TPS or throttle position sensor check. A huge thank you here to the online community that is the Org. Having trawled through there for information, I was able to perform the adjustment with perfect ease and soon had her running like she should and pulling away with a new found vigor. Jolly good stuff in my book, I should say. Once again, Carol and her fabulous photography skills come to the rescue. The little dash before the C indicates that the TPS is wrong. Better, but not quite there yet. So that was our September and in a strange kind of way that you could almost call curious, we had some adventures. See you soon.